Bored out from having a cold – not super ill, but not well to do something that needs more advanced (read study literature) efforts from the brain or going on a photo excursion in the lovely winter weather here – I jotted down writing samples from all (except my Lamy Vista with Sunflower yellow – forgotten as so often) my currently inked pens. Since I wrote that I shouldn’t post another YOL photo today I only captured the Italian pens on photo today. Stipula Ventidue Marbled Blue, Aurora Talentum Fire Engine Red, Stipula Ventidue Marbled Red, Stipula Suprema Pelago, Marlen Vienna. A nice finding today was that Diamine’s Amazing Amethyst and Yard-O-Led Viceroy with a broad nib is a very good combination. The Amethyst is as made for a B nib that brings out the colour and character of the nib. The Diamine Monaco Red with its warm, deep red hue is a very good companion to the Yard-O-Led Retro. It needs a broad or and italic to show its full potential. Another very fortunate combination is the Marlen Vienna with a fine nib and the Diamine Registrar’s ink. It is wet enough to handle the dryish Registrar’s Ink well and has spring enough to make justice to the Registrar’s beautiful shading. I like this combo very much – especially since I prefer F nibs for study jotting/notes/all kinds of fast writing and think that the Registrar’s is an excellent ink for note taking. Fast drying, waterproof and “neutral” without being boring. 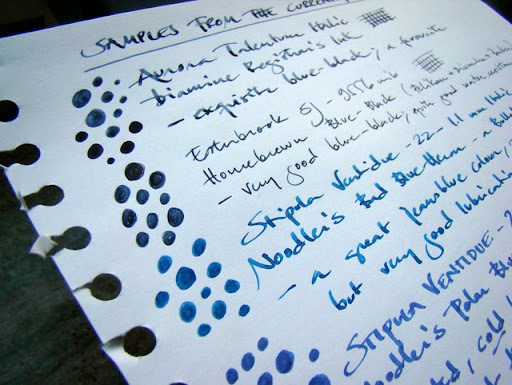 Noodler’s Bad Blue Heron has become one of my favourites very fast. It is a little bit tricky – the flow could be a little better – but is a beauty to behold in the Stipula Italic. 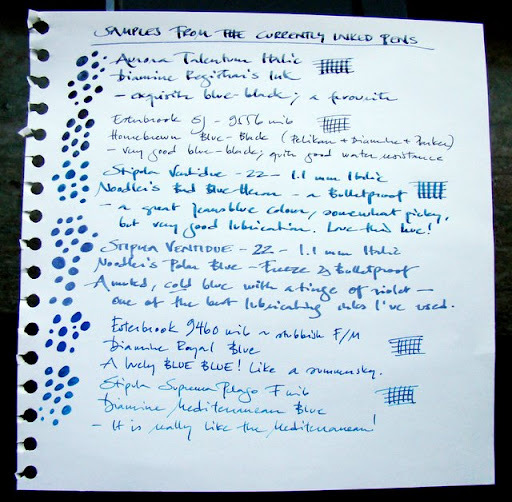 If one looks for a very smooth, lubricating, blue ink the Polar Blue is an incarnation of smoothness and lubrication. A very cold blue hue – the right shade for a Polar Blue. This entry was posted in aurora, esterbrook, fountain pens, inks, marlen, pens, photo, pilot, Pilot M90, Pilot Vanishing Point, stipula, writing, yard o led and tagged aurora, diamine, fountain pens, ink, marlen, noodler's, pens, photo, pilot, reviews, stipula, writing, yard o led. Bookmark the permalink. Peggy: Thanks for well wishes. The dots/bubbles tradition started out when I was writing a review some months and answered the phone and began to doodle with the pen while talking on the phone …totally unintended as so many things. I am happy to hear that you find them useful. I think they give a rather good idea of the ink and I prefer them to swabs since they are done with the nib and thus (IMO) closer to the real thing. Tortoise: I am so happy to hear that you like my reviews and I really hope that you like the Stipulas. I have actually three ventidues and one suprema now – all bought to ridiculously low prices. I have noticed that the ventidues need some time before the ink flow gets stable (on the italics that is) – I don’t know why, but they seem to need some break in time. I would be happy to hear how you find them! Thanks to each one of you that reads my blog and who take time to write comments and feedback – it is much appreciated and motivates me very much! And – of course – a big thanks to everyone that reads the blog – thanks for finding it worth reading! My Suprema & the Fine-nibbed Ventidue arrived yesterday. It was instant love! 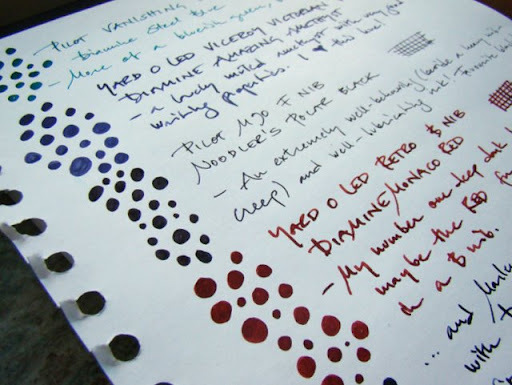 The Ventidue writes wet & smooth with a great feel. The Suprema is more of an extra fine, and was a bit dry until I fiddled with it some. It is just fun to use. I like it so much that I decided to get the grey Pelago version as well. Regina Martini is fitting it with a .9mm italic 14k nib for me. Of course, that means it will cost a whole lot more than the 3 I got from her ebay site for around $76 each. 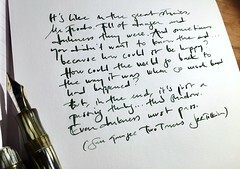 Still, I consider it a bargain for a beautiful celluloid, piston-filler, 14k italic. Thank you so much for the reviews which clued me in to these great little pens and to the martini.de site! I am so happy to hear that you like the Stipulas!!! May I ask (you can write a message through the contact page if you want) how much you had to add to the Suprema to get a 14 k nib? I’d be very interested to do that! Wow….lovely colors. I love all the blues and that Amazing Amethyst is really lovely, isn’t it? 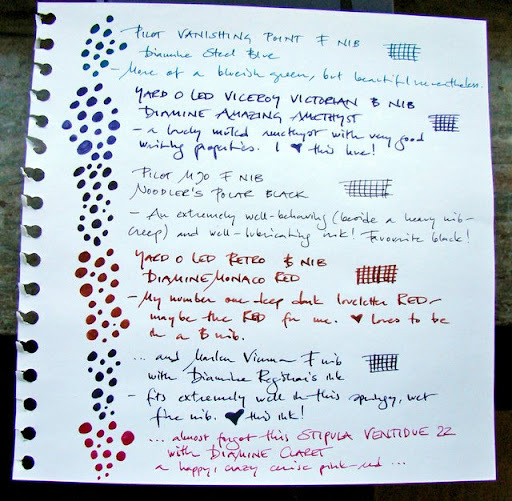 I love your ink samplers because of the dots/bubbles. That’s so cool. Thank you all for such a positive response! Much appreciated! Mille grazie! It would be nice to hear what you think about the Monaco Red when you have tried it in a broad – please post or tweet about it, Dizzypen! I couldn’t agree with you more about the Amazing Amethyst and the Bad Blue Heron! I really like the bubbles you made down the side. ;) And, you have a lot of blue shades! Really makes me like how the Monaco Red stands out. I’m blown away, great post!